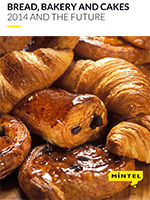 This global annual market overview will provide you with an in-depth review of the key issues in the global bread, bakery and cakes market through 2014 as well as our forecast for what will happen in 2015 and beyond. The global bakery market remains a huge, but challenging, sector of the food and drink industry. Packaged bread sales are dominated by the US, which along with the UK in second place, are markets struggling for growth as changing ways of eating continue to undermine bread’s traditional role. Competition within breakfast foods in particular has eaten away at bread’s position in these markets. The category has largely failed to innovate in on-the-go breakfast products, compared to other areas such as cereals, bars and biscuits. Growth in the global market is driven by Asian markets, such as China, where western-style bakery is becoming a wider part of the diet, and by large existing unpackaged bread markets, such as India and Turkey, where the growth of modern retail channels is fuelling a gradual move to packaged bread. Sweet bakery is a more developed category globally with China, Japan, Russia and Mexico, as well as the US, featuring as the top markets. The category is also generally offering better growth opportunities as the demand for sweet treats holds up despite continuing pressure around the high amounts of fat and, especially this year, sugar, in the diet of most consumers.